Ukash is the best option for low deposits, but getting your cash back into your pocket can be expensive. Ukash is an e-voucher system, similiar to PaySafecard. In brief, you buy the ‘card’ – which is actually a 19 digit code number – at a real world shop and then use that as money on the internet. The main benefit of using Ukash is you don’t have to use your personal details in order to make a payment online. That benefit is not of much use to online poker players, as their personal details will already be in their poker account. Even so, it is a quick and convenient method of making payments at poker sites. This company has been operating since the early years of this century, and is growing both in popularity and in support by more and more online gambling sites. One advantage this evouvher system has over other similiar systems is that you can actually withdraw money from the Ukash system at bank machines. The fees are a bit steep if you do this though, but at least it is instant. If you want to use this withdrawal feature you will need to create an online account with this business in order to convert your vouchers to withdrawal codes. To create an account go to the Ukash Website. UKash vouchers can be bought online, with lowest denomination being £5.00. The largest value card you can buy is £200. In the real world you can buy these cards at a number of different outlets, but be aware that the denominations on offer are not the same in all outlets. The lowest value one we found was for £5.00 using the Paypoint service (UK). If you are playing poker online at anything other than the very lowest level you probably will choose a different method to manage you finances. The fees involved in moving cash through this system for a player that intends to do so on a regular basis are too high to be sustainable. This service stands out for the lower stakes player though as the minimum amount you can deposit at some poker rooms can be as low as £1.00. Or even lower, but that would be almost pointless. The low limits do not apply to all rooms as you can see from the table below. * Listed as no minimum amount. It is simple to get started with this payment method. If you already have a poker account, just buy the voucher in the amount you want, either online or off, and use that 19 digit pin number to deposit your funds online. You can create an account to manage your vouchers at the ukash.com website. As I mentioned above, if you want to use this system for cashouts as well as deposits, then you will have to create one of these accounts. In order to make a withdrawal from an ATM you need to convert your vouchers to withdrawal codes. This can only be done in their online account. Set up should not take too long though. Withdrawing using this method is expensive when compared to other methods, costing up to £3.75 to make a one hundred pound withdrawal. You can also get a prepaid MasterCard debit card on your account. That could be convenient for making cash withdrawals of your winnings from ATM machines. The fees for withdrawals on this debit card are much better than those applied to cashouts using the coucher system. The rate varies by country, but for example in the UK a flat fee of £1.50 applies to ATM withdrawals up to a maximum of £300 per day. The card is not free though, costing up to £9 initially, and there is also a charge for reloading the card, which I think is a bit over the top. The main reason to use this system is its convenience. But that does not really apply to poker players. When you factor in the fees associated with using the debit card, or using the voucher system to get your money back, it is not as cost effective as other online banking methods, such as Skrill. For players that like to play at the lowest stakes possible, you will find it hard to beat the minimum limits you can find using this method. Some sites, for example CoolHandPoker – a MicroGaming site – states that there is no minimum deposit amount for players using this method. I assume that means that you can deposit from as low as 1 penny, though I’m not sure why you would. 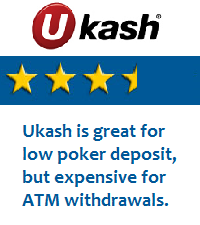 Deposits using Ukash are normally credited to your poker account instantly. You can of course use this system to make a withdrawal from your poker account too. Ukash vouchers are available in amounts from £5 up to £200. You can combine vouchers if you want to deposit more than that, and split vouchers if you want to deposit less. I have never had to use their support system, so I cannot say if it is good or bad. They have a contact form here that you can use to raise any support issue. On that page also you will be able to find a telephone support number that should be local to you. This company does have a customer charter and maintain that they are committed to providing a quality service, but as I said, I have never had to contact them so I cannot say how good they are.